If you look up the word “pathos” in the dictionary, you’ll find The Gift of the Magi by O. Henry. Not really. But we consider that an oversight to be corrected. Some people consider the story comic, what with the twist and all: the married couple each giving up something cherished in an attempt to give one another a significant and meaningful gift — only to wind up weirdly missing the mark. How is that funny? It’s not. It makes you cry. They’re poor as church mice and at the end of it all, what do they have to show one another? Bupkis. Except for the love between them, of course. One of Columbus’ most famous temporary residents was the author of that story. 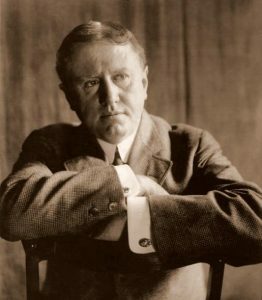 O. Henry, the best-known pen-name of short story William Sydney Porter, spent three years in the Ohio Penitentiary on a charge of embezzlement. He’d been on the run and hiding in Honduras, but when he learned his wife was dying of consumption (tuberculosis), he came back to the United States and faced a jury. Some of his stories were even published while he was jailed. The Gift of the Magi wasn’t one of those, but it is unarguable the most famous story written by this popular and prolific writer. Porter died young, and we’re not sure if ever came back to Ohio after leaving the penitentiary in Columbus. Some folks say that his pen name came from his time behind those walls: “O. H.” from Ohio, and then “enry” from “penitentiary.” We think that’s a bit of s stretch but we’ll also take it. If the story makes you cry or makes you smile, it is truly about the spirit of giving and really giving until it hurts. May the spirit of the season grow large and bright within you.